Runswick Wall Mounted Electric Fire E120R. 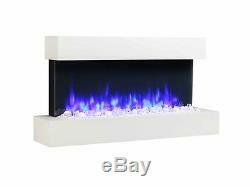 Runswick Wall mounted electric Fire E120R. 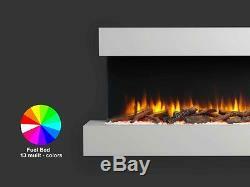 Modern design with an off white MDF mantel & plinth with a toughened glass fronted electric fire. 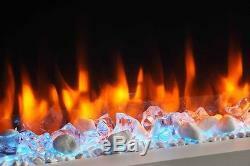 The product has an amazingly realistic flame effect and log bed display. The flame effect has 3 different light setting and log bed having 13 different colour light settings all controlled by the multi function LCD display with 7 day Programmable remote control. The flame effect can be adjusted for intensity/brightness, used by itself or together with the mood lighting and the heat settings. The mood lighting can be cycled through the 13 available colours and includes a dimming function and can be set to a stationary colour. Thermostatic multi-functional 7 day programmable remote control with LCD display, The remote control will automatically turn the fire on & off and between 1 & 2kW as the room temperature requires. Low running cost for flame effect and mood lighting, less than 11w per hour less than. 4 per year if used 5hrs per day. Mains cable length 1.7M. Quiet heater operation with down facing outlet so TVs can be mounted above. Dimensions L 1100mm x H 590mm x W 250mm. Remote control functions - Off/On, flame effect, mood lighting, heater, thermostat, programmer, to off timer. ECODESIGN 2018 Compliant (Lot 20). To meet the requirements of Eco design 2018 (Lot20), this product is designed and manufactured to produce the optimum energy efficiency available for space heaters. The digital remote control includes a seven day programmer, thermostat with display, room temperature sensing in the remote control, open window detection and adaptive start control (Turns on the heater to warm the room ready for the programmed start time). 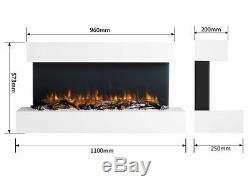 The item "Endeavour Fires Runswick Wall Mounted Electric Fire 220/240Vac 50 Hz 1&2kW" is in sale since Monday, October 24, 2016. 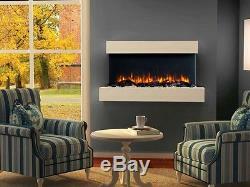 This item is in the category "Home, Furniture & DIY\Fireplaces & Accessories\Fireplaces". 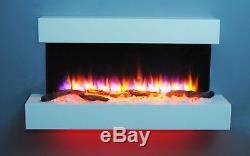 The seller is "endeavourfires" and is located in Scarborough, North Yorkshire. This item can be shipped to United Kingdom.